To ignore entirely the basic rule about never starting any piece of writing with a digression: I think it’s probably fair to say that when you’re lost at night in the eerie, empty alleyways of Venice, the last thing but one that you need is for a monk suddenly to emerge directly in front of you. The very last thing you need, just a few minutes later, is to encounter a girl wearing a red kagool. meaning that large parts of it are accessible for just a few weeks; the site still contains active naval and military establishments and is generally closed to the public. The famous biennale, the art festival that coincides with the Venice Film Festival, takes place in odd-numbered years, but we were able to visit the architecture biennale. Now, my attitude to modern architecture is pretty much the same as the next man’s, as long as the next man happens to be Prince Charles, but it has to be said that many of the festival displays were impressive and interesting (although inevitably, there were also frequent dollops of pretentious tosh). Even so, I was probably the only person in the building at the time who was more interested in taking photographs of the roof and the walls than the displays of model buildings that so engaged the hordes of earnest young architecture students all around me: the main display area was inside the dockyard corderie or ropery, originally built in 1303 and rebuilt in 1576-85 into a huge building some 316 metres long. From the corderie and the adjoining artiglierie, the former workshops, we were able to sit out and enjoy the unseasonable hot and sunny weather on the quayside of the Darsene Nuovissima, the newest dockyard basin (‘newest’ meaning fifteenth century), alongside the huge Armstrong, Mitchell crane, the last survivor of nine vast hydraulic cranes built at Newcastle between 1877 and 1905 and installed in shipyards from Liverpool to Japan. A major conservation project is now under way to preserve the crane for the future. 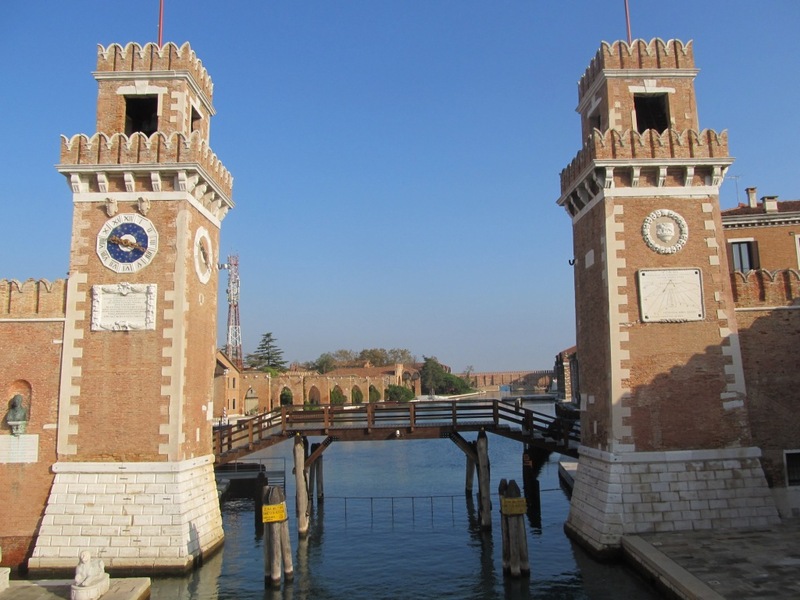 Nearby are the Gaggiandre, two superb covered docks for galleys built between 1568 and 1573, when the naval power of the Venetian Republic was at its height. 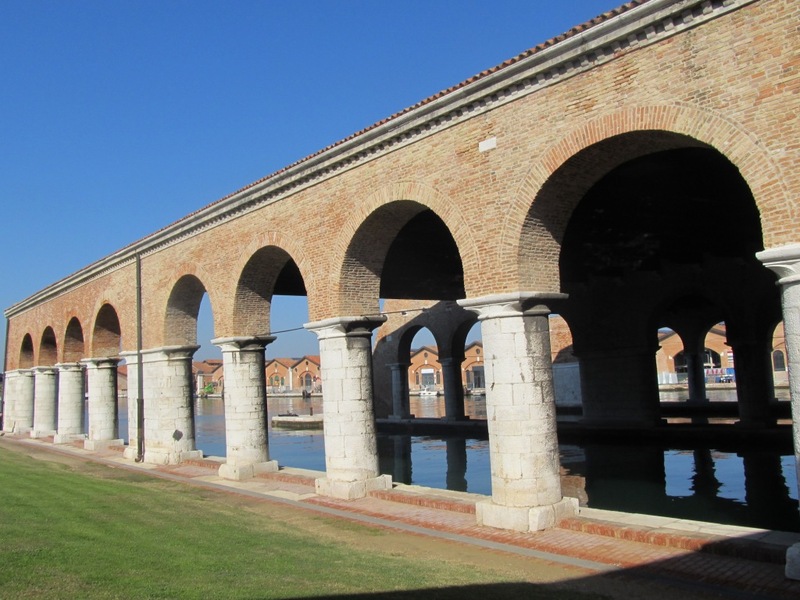 The Arsenale as a whole was, at one time, the largest industrial enterprise in Europe, covering some 115 acres and employing 2-3,000 men. During the Middle Ages it used a sophisticated production line system for building ships and galleys, many centuries before Henry Ford ‘rediscovered’ the technique (so much for history being bunk, eh, Henry?). But as the republic’s power waned, so did the Arsenale’s; by the late seventeenth century the workforce was less than a thousand strong, making Chatham dockyard larger, and its focus was increasingly on mercantile, rather than naval, ship repair. 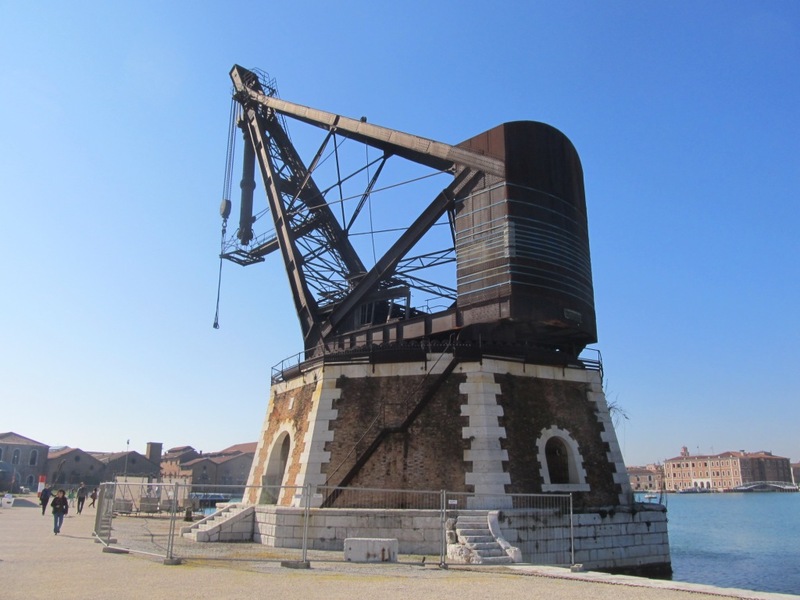 Today much of the huge site is clearly under-utilised, despite the occasional fillips provided by the biennales, but in a sense this is probably a good thing – the conversion of the Arsenale into yet another dubious tourist trap would probably destroy much of the character that it still preserves, namely that of a naval/industrial complex of the first order. notable being that of the last bucintoro, the ceremonial barge of the Doges and the setting every Ascension Day for la sensa, the remarkable ‘marriage ceremony’ between Venice and the sea; sadly, the real thing, together with most of the Arsenale, was destroyed by Napoleon in 1797. 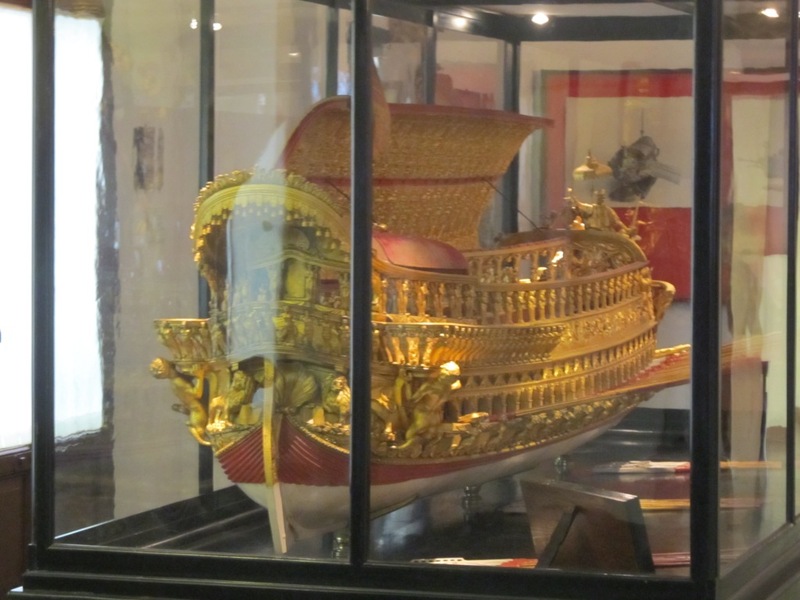 There are also carvings from Venetian galleys of the 17th and 18th centuries, together with relics of more recent eras – a lot of material about the Austro-Hungarian navy, including part of the stern of the pre-Dreadnought battleship Wien, and many exhibits about the Italian navy of World War I and II, including an example of a submersible ‘chariot’ like the ones which attacked the British battleships Valiant and Queen Elizabeth in Alexandria Harbour on 19 December 1941. 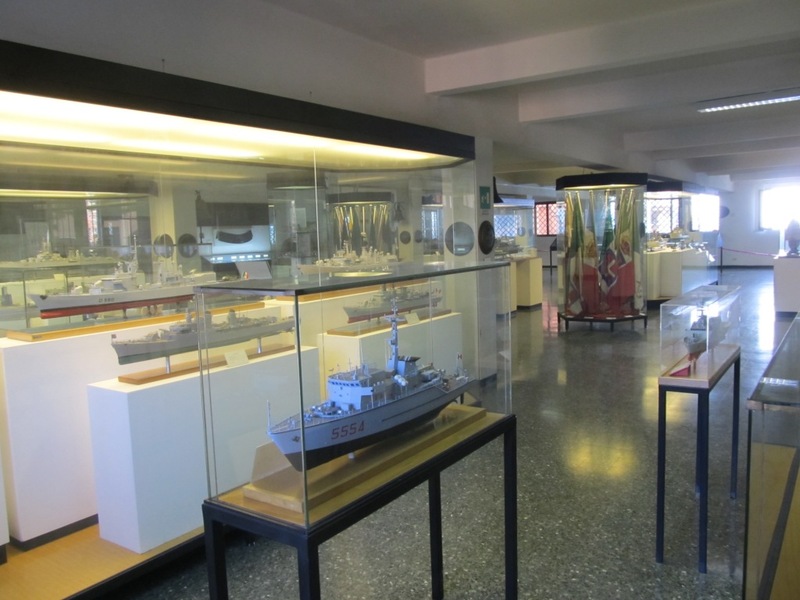 All in all, Venice is a naval buff’s dream, especially if you can get there during a biennale. So will a future Quinton story be set there? No spoilers, but what author could resist such a setting? In my period, Venice was in decline, a fact demonstrated most clearly by the loss of Candia (Heraklion, Crete) in 1669 after a siege of 22 years, the longest in history. Yet it rallied, thanks partly to the astonishing character of Francesco Morosini, the admiral who surrendered Candia to the Turks. Tried for cowardice and treason on his return to Venice, he was acquitted and went on to lead the Venetian conquest of the Morea in 1685, subsequently being elected Doge – the nominal figurehead, or President, of the Venetian Republic. 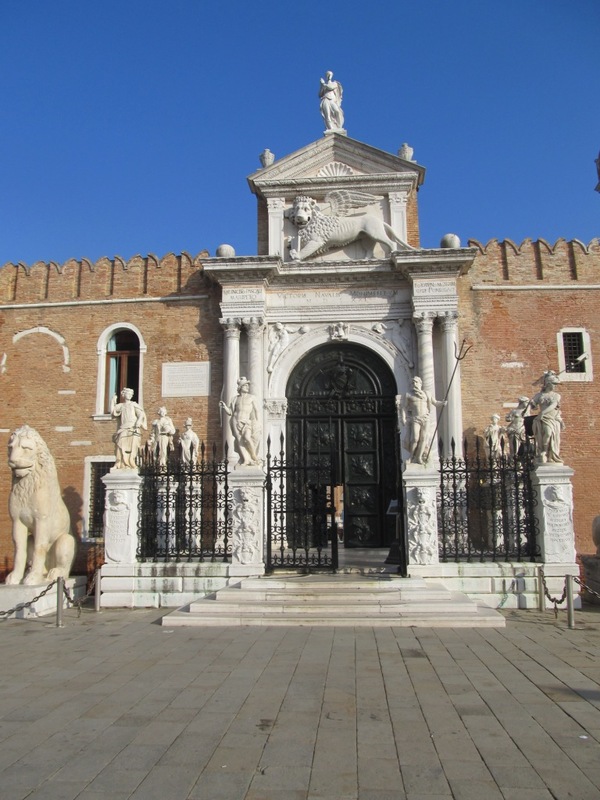 Add such ingredients as the Republic’s secretive Council of Ten, its feared state security body, and the Bridge of Sighs through which prisoners passed from the Doge’s palace to the prison cells, and there’s clearly plenty of raw material. But if I ever do get round to writing a Venice-based Quinton story, it’ll be quite a long way down the road!